The Politics of Imagination offers a multidisciplinary perspective on the contemporary relationship between politics and the imagination. What role does our capacity to form images play in politics? And can we define politics as a struggle for people’s imagination? As a result of the increasingly central place of the media in our lives, the political role of imagination has undergone a massive quantitative and a qualitative change. As such, there has been a revival of interest in the concept of imagination, as the intimate connections between our capacity to form images and politics becomes more and more evident. 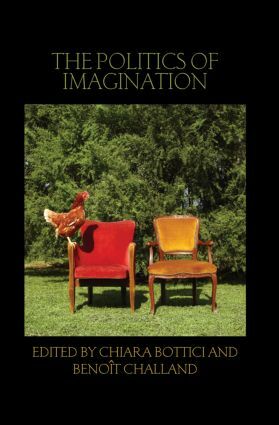 Bringing together scholars from different disciplines and theoretical outlooks, The Politics of Imagination examines how the power of imagination reverberates in the various ambits of social and political life: in law, history, art, gender, economy, religion and the natural sciences. And it will be of considerable interest to those with contemporary interests in philosophy, political philosophy, political science, legal theory, gender studies, sociology, nationalism, identity studies, cultural studies, and media studies. 1: From imagination to the imaginary and beyond: towards a theory of imaginal politics, CHIARA BOTTICI AND BENOÎT CHALLAND; 2: Politics at its best: reasons that move the imagination, ALESSANDRO FERRARA ; 3: The politics of imagination: Spinoza and the origins of critical theory, THOMAS HIPPLER; 4: From soul to mind: psychology and political imagination, ADRIANO BUGLIANI; 5: Imagination, imaginary and the bioeconomic turn of cognitive capitalism; 6: Imagining the west, perceiving race: social sciences and political imagination, ALANA LENTIN; 7: Politics and the Messianic imagination, ARMANDO SALVATORE; 8: Religion and the struggle for people’s imagination: the case of contemporary Islamism, BENOÎT CHALLAND; 9: Modern politics and the historical imaginary, HAYDEN WHITE; 10: Literature as public reasoning in the political struggles over imagination, MEILI STEELE; 11: Feminist imagination: the aesthetic role of critique and representation, MARÍA PÍA LARA; 12: Visual studies and global imagination, SUSAN BUCK-MORSS. Chiara Bottici is Assistant Professor of Philosophy at the Department of Philosophy of the New School For Social Research. Benoît Challand is visiting Associate Professor at the Department of Politics of the New School for Social Research and Lecturer at the University of Bologna.